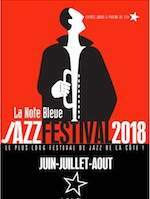 In the jazz lounge, two performances, on 18 and 19 July, by Les Barons. Les Barons are Christian Pachiaudi on bass, Alain Asplanato on drums, Amaury Filiard on guitar, and Fred D'Oelsnitz on piano. Formed in 2017 and based in Nice they play original compositions and covers of jazz rock and fusion, especially from the 70s and 80s.